Has Grimes found evidence of global warming in New Zealand? And would that be in the same way as Lemon and Paeroa is considered world-famous in New Zealand? In other words, it’s not global warming in any scientific sense? Weather Watch’s Philip Duncan describes the reason for June’s mild temperatures. Only changing winds can make the temperature change suddenly—what else could it be? It’s odd that he makes no claim of global warming, for usually he jumps at the chance, but the slightly high temperatures are no more than natural variation, not global warming. It was caused by winds bringing tropical air to the country. Weather Watch’s Philip Duncan made a video in which he mentions the winds in June before predicting normal winter weather arriving this week. He describes the reason for June’s mild temperatures (the wind) and for the coming wintry blasts (the wind). If you haven’t seen it, you must catch his cute animation showing winds moving around the country. Apparently Jim Salinger put Grimes up to this dramatic climatic development, saying that six stations reported record high June temperatures. If either Salinger or Renowden had tried to finger global warming for the June temperatures, I would have called him a fibber-foo, so they’re lucky they didn’t. I almost wish Grimes had claimed that global warming is worse than ever and we’re all going to die, because it’s really hard to maintain any interest in this non-story. I can see how newspaper editors are tempted to publish stories about disastrous warming. Even if it’s not true, it’s jolly interesting. 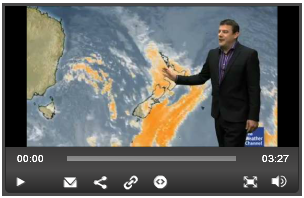 Well, the snow has arrived on cue and the South Island is getting hammered. Bring it on! Skis waxed and ready to go! I expect a low verbosity level (my Command Line Interpreter prompts me) from you until spring thaw then Andy? And one wonders all that money that has been wasted on trying to prove global warming, what that money could have done to provide new antibiotics for humanity. There have been no new antibiotics for 25 years, which now puts us all at risk from infection that cannot be stopped. We are now been warned of this, and yes I take it seriously. So thank you global warming alarmists we now do have a real problem, please remove yourselves from the disaster stage and let those who need the resources ($) do something real for humanity. “Jamie Whyte, leader of the ACT party in New Zealand, was this week awarded the IEA Seldon Award for his publication Quack Policy, Abusing Science in the Cause of Paternalism. Thanks for posting that Andy. An excellent monograph. That is, NZ is not a net emitter according to The Greenhouse gases Observing SATellite “IBUKI” (GOSAT).